A native of Berkeley, California, violinist Nathan Olson began his appointment as Co-Concertmaster with the Dallas Symphony Orchestra in September 2011. He served as Adjunct Faculty at the University of North Texas College Of Music in 2013-16, and was recently appointed Adjunct Faculty at Southern Methodist University. A graduate of the Cleveland Institute of Music's prestigious Concertmaster Academy, Nathan studied with William Preucil and Paul Kantor. Currently Concertmaster of the Breckenridge Music Festival, he has participated in the Mainly Mozart Festival, the Bravo Vail Music Festival and the Amelia Island Chamber Music Festival. An enthusiastic chamber musician, Nathan is a member of the Baumer String Quartet, whose debut recording will be coming out in the next year. The BSQ serves on faculty at the Crowden Chamber Music Workshop and the Monterey Chamber Music Workshop, and has held residencies at several institutions, including the University of North Texas, the University of South Florida, and the University of South Dakota. A winner of the Joseph and Elsie Scharff prize in violin at CIM, Nathan has performed as soloist with the Dallas Symphony Orchestra, the Canton Symphony Orchestra, the Breckenridge Music Festival Orchestra, the Cleveland Pops Orchestra, CityMusic Cleveland, the San Francisco Chamber Orchestra, the Berkeley Symphony, the Oakland East Bay Symphony and the Lexington Bach Festival Orchestra. In recent seasons, Nathan has appeared as Guest Concertmaster with the symphony orchestras of Pittsburgh, Toronto, Omaha, and Tucson, and as Principal Second Violin with the St. Paul Chamber Orchestra. While completing his Bachelors degree at the Cleveland Institute of Music, Nathan earned minors in both Mathematics and Music Theory. ﻿AARON REQUIRO, Violinist, from Oakland CA, has been an active performer and teacher around Phoenix, and Northern California. Mr. Requiro is former assistant principal second violin of the Elgin symphony, and performed with Symphony Silicon Valley, Oakland East Bay Symphony, San Francisco Chamber Orchestra, the Grant Park Festival Orchestra, as well as Citymusic Cleveland, and the Wisconsin Chamber Orchestra. 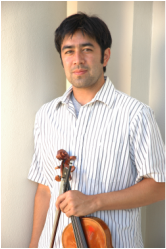 He is currently assistant concertmaster of the Oregon Coast Festival Orchestra and a member of the Phoenix Symphony. As a chamber musician, he was a member of the Vinca Quartet as well as the Kashii String Quartet and has concertized around the U.S. and Europe, as well as winning silver medal at the Fischoff Chamber Music competition with the Kashii SQ and 2nd prize at Chamber Music Yellowsprings competition as a member of both quartets. In addition to teaching privately, he has been a chamber music coach for summer programs and festivals including The Crowden Summer Chamber Music Program, Music@Menlo, The Innsbrook Music Festival and Institute, Killington Music Festival and Chamber Music of the Rockies. Aaron began his studies at the Crowden School, and studied with its founder, Anne Crowden. He received his M.M. in violin performance at the Cleveland Institute of Music, where he was a student of David Updegraff, and worked extensively with Peter Salaff and the Cavani String Quartet. He received his B.M. in violin performance from the University of California, Santa Cruz, as a student of Roy Malan, where he was an Eltinge Family scholar, a Dean’s Award recipient, and a member of the resident string quartet. As a member of the Kashii String Quartet, he served on faculty at the Innsbrook Music Festival, and in March 2006, the Quartet recorded Aaron Jay Kernis's quintet 100 Greatest Dance Hits, with guitarist David Tanenbaum. John T. Posadas enjoys an active career as a performer and educator. Recitals have taken him across the country and abroad with appearances at the Kennedy Center, Tanglewood, Santa Fe, Aspen, and Chautauqua. His performances have been heard on NPR stations across the country and have been broadcast in 4 different countries. As a chamber musician, he has won top prizes at the Fischoff Chamber Music Competition and the Chamber Music International Competition and has collaborated with Edgar Meyer, James Ehnes, Joseph Silverstein, and members of the Cleveland, American, Muir, Pro Arte, and Concord Quartets. He is currently the violist for the Baumer String Quartet and the Ars Nova String Trio. Orchestrally, he has performed with the Houston Symphony, Boston Symphony, Santa Fe Opera, Chautauqua Symphony, Tanglewood Music Center Orchestra, and the Erie Philharmonic Orchestra. He currently holds the Lynne Haarlow chair as acting assistant principal viola of the Naples Philharmonic. ​An advocate for contemporary music, John has worked closely with many of today's leading composers including Joan Tower, Augusta Read Thomas, and Elliott Carter. He has given world premieres at the Aspen Music Festival, Tanglewood, the Chautauqua Music Festival, and the Deer Valley Music Festival to name a few. A sought-after clinician and teacher, Posadas has taught masterclasses and lessons at institutions across America, including the Cincinnati Conservatory of Music, University of North Texas, and the University of Kentucky. Most recently he has served as a faculty member at Chamber Music of the Rockies, the Brevard Chamber Music Seminar, the Crowden Music Center Chamber Music Workshop, the Sequoia Chamber Music Workshop, and the Monterey Chamber Music Workshop. Mr. Requiro has appeared as soloist with the Tokyo Philharmonic, National Symphony Orchestra, Seattle Symphony, and numerous orchestras across North America. His Carnegie Hall debut recital at Weill Hall was followed by a critically acclaimed San Francisco Performances recital at the Herbst Theatre. Soon after making his Kennedy Center debut, Mr. Requiro also completed the cycle of Beethoven’s Sonatas for Piano and Cello at the Phillips Collection in Washington, D.C. Actively involved in contemporary music, he has collaborated with many composers, including Krzysztof Penderecki and Bright Sheng, and gave the Dutch premiere of Pierre Jalbert's Sonata for cello and piano at the 2010 Amsterdam Cello Biennale. Mr. Requiro has performed with the Chamber Music Society of Lincoln Center, Seattle Chamber Music Society, Jupiter Symphony Chamber Players, and is a founding member of the Baumer String Quartet. In 2015, Mr. Requiro was appointed Assistant Professor at the University of Colorado Boulder and has previously served as Artist-in-Residence at the University of Puget Sound as well as Guest Lecturer at the University of Michigan. His artist faculty appointments include the Bowdoin International Music Festival, Giverny Chamber Music Festival, Innsbrook Music Festival and Institute, Maui Classical Music Festival, and Olympic Music Festival.